Growing more than a thousand plants from seed requires a lot of space if they are to be brought on and hardened off properly. 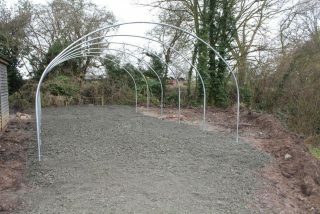 Our existing cold storage space couldn’t cope with such vast quantities, so we decided to expand it by building a polytunnel. When the parts for the construct arrived, we were rather intimidated by the number of pages in the instruction booklet. However, our resident landscaper, Joe Humphrey, picked up the gauntlet and set to work on a bleak February day. 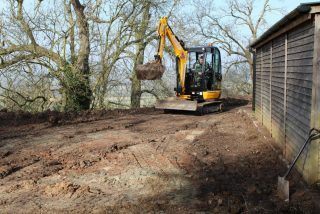 First we had to level the ground in the designated area using a digger. 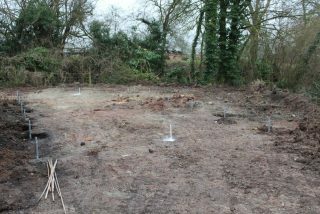 Next, the base had to be laid out and the positions for the anchor plates accurately measured before concreting them into the ground. Measuring the base and fixing the anchor plates. It was not without trepidation that the ridge poles were inserted into the anchor plates – thankfully, they all fit perfectly! 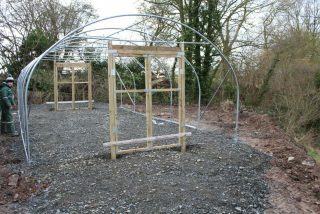 With the ridge poles in place, the structure started taking shape. The skeleton of the tunnel. Having added a huge number of further poles for stability, the doors were fixed in place. 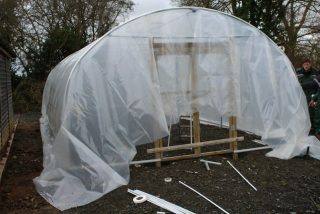 We had to wait for a still day before unrolling the huge sheet of polythene for the tunnel cover. 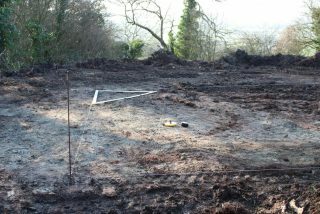 We had nightmare visions of this taking off like a paraglider with our garden team in tow! But all was well: the polythene stayed in place, nobody flew off and the monster was successfully tied down. Covering of the tunnel and the “finished article”. 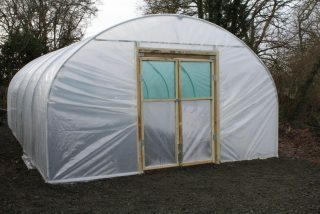 The tunnel is ready, and the first plants have already moved in!